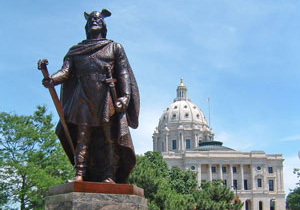 The next upcoming Leif Erikson Day is on Wednesday October 9th, 2019. Leif Erikson day falls on October 9th each year and honors the first Nordic person to visit North America. The day is not a public holiday but rather an observance so government and business offices will be open with standard hours. This day is a day to reflect on the accomplishments of Leif Erikson and his extraordinary story of traveling all the way to North America. As a Norwegian born in Iceland, Leif Erikson worked for the Norwegian King Olaf and in that time converted to Christianity. He later around the year 1000 AD explored the land west of Greenland and eventually is believed to have settled on Baffin Island as well as Labrador in modern day Canada.